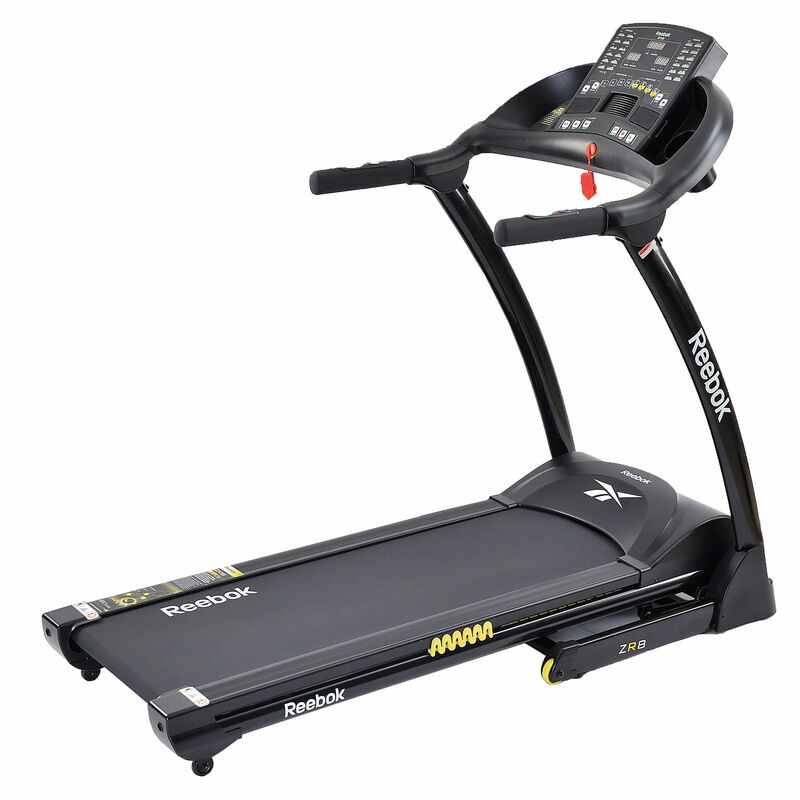 The Reebok ZR8 treadmill is Reebok’s mark 2 version for the highly popular Z8 Run treadmill. The original Z8, launched in 2011, represented the brand’s first attempt at a machine that was both compact and feature rich. We really liked with the original Z8 treadmill, so is this ZR8 much of an improvement? In short, we’re impressed! At its heart, the ZR8 has a 2 HP continuous duty motor that drives the running belt all the way to the machine’s top speed of 10 mph. It also offers a wide range of 12 levels of electronically adjustable incline! The treadmill itself is solid and sturdy and the running deck is actually bit larger than the most compact treadmills which typically have a 41 cm by 126 cm length deck. The width is pretty much the same, but the length is 12 cm longer, which makes a noticeable difference for those wishing to attempt running, rather than jogging. We think Reebok must be quite proud of the cushioning on the ZR8 treadmill as there’s promotional sticker on a couple of places on the machine itself highlighting it! The ZR8 features the latest cushioning from Reebok which uses technology from the Zig cushioning found in the popular shoes. From our understanding, this provides additional cushioning on heel impact and to provide a firmer surface at the point of push off. Having tried it, we can confirm that it’s got a nice feel about the deck. In terms of controls, the ZR8 ticks the boxes with both buttons on the handrails as well as short-cut keys on the console for changing both speed and incline. The console is also quite good. In terms of feedback, there are 3 clear LED windows that provide information on speed / distance covered, exercise time / calories burnt and incline level / pulse rate. In terms of programs, Reebok have really pulled out the stops and included more programs on this treadmill than we’ve seen on any other treadmill at these types of price points! 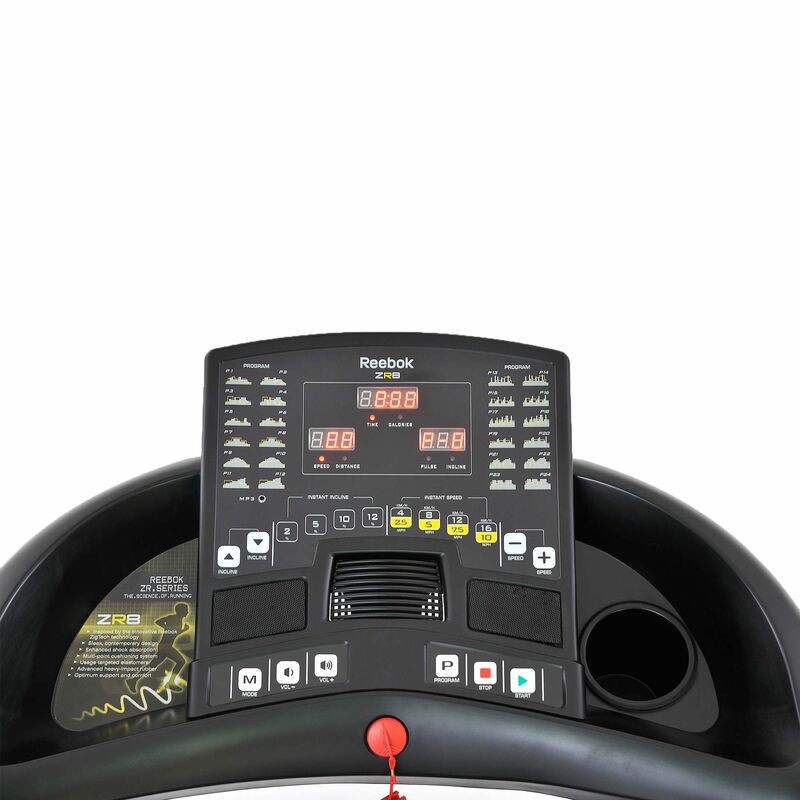 The manual program enables target distance, speed or calories to be set and the speed and incline are controlled by the user while the selected target counts down. There are 24 preset programs whose speed and incline profiles are printed right on the console as well as 3 user defined programs for the ultimate flexibility. A pair of pulse grip sensors provide estimates of heart rate when grabbed for a few seconds and these are also used for the body fat test function. In addition, the console also features a pair of speakers and as well as a fan! However, on both the speakers and the fan, this seems to be very much an exercise of ticking boxes on spec sheets as the speakers are very tinny, and the fan doesn’t seem to move much air! The folding mechanism is easy to use and provides hydraulic assistance. Transport wheels are also provided which enables the treadmill to be tilted and moved about whilst folded. The warranty on the ZR8 treadmill is Reebok’s standard 2 years parts & labour. Reebok faced a big challenge trying to improve on the highly successful Z8 treadmill, but with the ZR8 they have, for the most part, done that. It's a solid, compact, treadmill that delivers on the basics. However when it comes to the compact treadmill market things never stand still and it's got some serious competition in the form of the Viavito LunaRun which folds completely vertically making the footprint when folded a truly tiny 25cm x 70cm (9.8” x 27.5”) while at the same time providing an almost identical running surface to the ZR8 (to within a cm on width and length) and a true 10% incline.